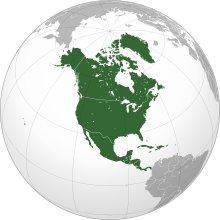 North America is a continent in the Earth's northern hemisphere and almost fully in the western hemisphere. It is bordered on the north by the Arctic Ocean, on the east by the North Atlantic Ocean, on the southeast by the Caribbean Sea, and on the south and west by the North Pacific Ocean; South America lies to the southeast, connected to North America by the isthmus of Panama. It covers an area of about 24,490,000 km² (9,450,000 sq mi), or about 4.8% of the planet's surface. As of October 2006, its population was estimated at over 514,600,000. It is the third-largest continent in area, after Asia and Africa, and is fourth in population after Asia, Africa, and Europe. Central America is the central geographic region of the Americas. It is variably defined either as being a region of the Americas in its own right or as the southern portion of North America. The Caribbean is a region of the Americas consisting of the Caribbean Sea, its islands (most of which enclose the sea), and the surrounding coasts. The region is located southeast of Northern America, east of Central America, and to the north and west of South America. Español América del Norte es un subcontinente que forma parte de América, situado en el hemisferio norte, y casi por completo en el hemisferio occidental. Limita al norte con el Océano Glacial Ártico, al este con el Océano Atlántico, al sureste con el Mar Caribe y al sur y al oeste con el Océano Pacífico. Al sureste está unido con Centroamérica por el istmo de Tehuantepec. Français L’Amérique du Nord est un continent ou la partie nord de l’Amérique, selon le point de vue. Elle se positionne à l’est de l’océan Pacifique, à l’ouest de l’océan Atlantique, au sud de l’océan Arctique et au nord de l’Amérique du Sud. More images North America - North America (Category). The four NERC Interconnections, and the eight NERC Regional Reliability Organizations. This section holds a short summary of the history of the area of present-day North America, illustrated with maps, including historical maps of former countries and empires that included present-day North America.